My friend Kathy was deployed with my on my Provincial Reconstruction Team. She was a civilian and worked for the United States Department of Agriculture and had a different perspective than the military members. She worked hard while she was there and was able to learn a lot about the culture and the people. She just started a blog (White Haired Wisdom) and I have loved reading her perspective. I asked her if she could write something up for my blog and I am excited to share. During my training in preparation to deploy to Afghanistan as an agricultural adviser, I learn that Afghan women have a very different place in society than western women do. I am told there are three sexes in Afghanistan – Afghan and western men, Afghan women and western women. 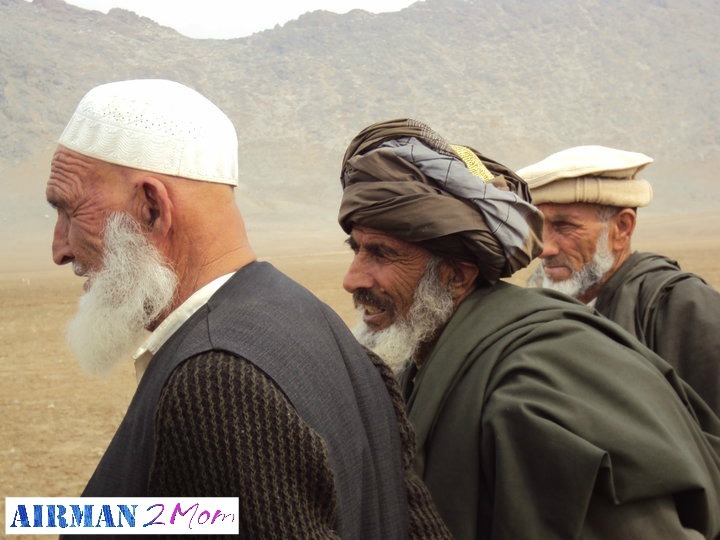 I wondered if I would be accepted by Afghan farmers, either as an American or as a woman. I receive a lot of advice on how to dress and act, but I made the decision early on to rely mainly on just being myself and letting my agricultural expertise speak for itself. After all, being a woman in agriculture for most of my life had taught me a lot about gaining acceptance right here in the good old USA. Soon after arriving at my post I went on a mission to the compound of the Director of Agriculture, Irrigation and Livestock (DAIL) in Kapisa Province with a group of American National Guardsmen to deliver agricultural seeds. As I began to mark off the variety and amount of seed, I noticed the Afghan farmers unloading the truck are either ignoring me or casting quick sidelong glances at me. I know I look strange to them and I am not offended by their curiosity. The men showed the signs of a lifetime of hard work. Although they look like they are in their 50’s and 60’s, most likely they are in their 30’s or 40’s. Life is hard there and people age quickly, with the average lifespan being 44. Their hands are calloused, many with injured nails that look more like the yellowed talons of some huge predatory bird. Their nut brown faces are lined from long hours in the unrelenting Afghan sun, made more searing because of the high altitude. Many are gap-toothed and their teeth are stained from tobacco use. To me their faces are made beautiful by the honesty of the hard work they must do to feed their families. I come from an agricultural background devoid of massive tractors and combines and I instantly feel a bond with these tillers of the soil. They are wearing salwar kameze, loose pants with a long tunic, many topped off with western-style sports jackets and vests. They are wearing headscarves or intricately wound turbans. The smell of stale sweat wafts over me in the gentle breeze that is tickling the leaves of the acacia trees under which we are seeking some shade. Some of the bags in the truck had split in transit and the seeds had spilled out onto the bed of the truck. The men raked up the seeds with their hands, careful to capture each precious seed. Some of the seeds are bright pick, having been treated with fungicide. “What kind of seeds are these?” they ask in amazement. My interpreter, Najib, is not an agriculture person and he lifts his shoulders in a gesture that says, “Beat’s me.” I lean over and say they are sorghum seeds. “Sorghum!” they say and nod their heads. Having broken the ice, they start to bring me other seeds, holding them out for me to see, waiting shyly for my reply. I identify barley, oats and soybeans. They are becoming friendlier and start making eye contact with me. They bring me a handful of turnip seeds. Najib doesn’t know the Dari word for turnip, so I draw the men a picture of a turnip and they smile with pure delight. As we get ready to leave, one of the turbaned farmers reaches into his pocket with his work-soiled and hardened hand, takes my hand and gently puts something onto my palm. I look down and see he has given me some dried mulberries and walnuts. I look up and smile, and he smiles back. Although the mix looks less than clean, I eat it with joy in my heart, because he has offered me his food. He is letting me know with this offering that he has accepted me. Kathy Gunderman is a fiction and non-fiction writer. 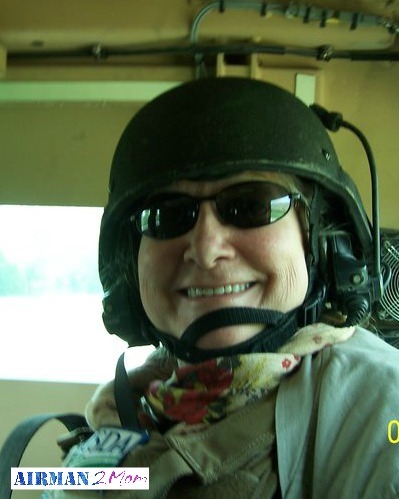 She graduated from Berry College, GA, with a dual degree is Animal Science and Industrial Education and spent 35 years working in natural resources and environmental sciences in private industry, state and Federal governments. 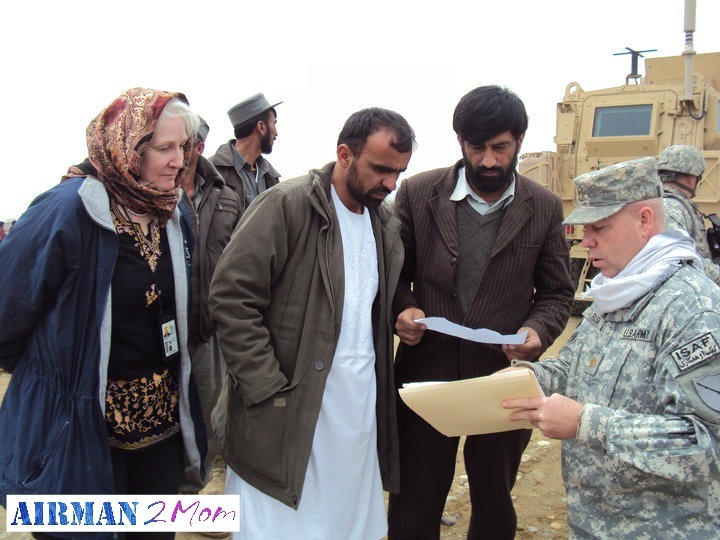 At the age of 57, she volunteered to go to Afghanistan as a USDA agricultural advisor and spent 26 months in reconstruction and stabilization efforts as well as providing support for other agricultural personnel in the field. She currently is the author of the whitehairedwidsom.com blog and is working on a memoir of her time in Afghanistan and a psychological thriller. That does sound like a great day. What an amazing experience.I just think that is the coolest thing that you stepped up to the plate like that and interacted by giving and gaining wisdom across those cultural barriers and thank you so much for what you have done for all of of us by serving! Wow… what an adventurous life and spirit! I loved this – and loved getting a glimpse into this whole other world! So thankful you made space for her to share here! Thank you for your kind words. It was the most rewarding thing I’ve ever done, except for being a wife and mom. It was truly a blessing and the plight of the people of Afghanistan so touched me. For another excerpt of my memoir check out my blog for today called “The Woman with the Turquoise Eyes.” It is a favorite of mine. God bless. So many lovely lines, like this one here, “I come from an agricultural background devoid of massive tractors and combines and I instantly feel a bond with these tillers of the soil.” May God bless you as you add your voice to the blogosphere, Kathy.